The Sense Herakles 3 Sub Ohm Tank is an intended name that represents this titan of an atomizer. Measuring in at 24" diameter, it holds a maximum juice capacity of 4.5ml. Made from stainless steel, so you know you're getting the best in constructive materials. It also boasts an innovative top fill design with a hinged lock to keep your e liquids from leaking. One of its most impressive features is the triple adjustable airflow control at base, measuring 9mm x 2mm each -- a feature very few if any other atomizers can offer. The V-Jet Coil System is comprised of a large single vertical structure and includes a 0.4ohm Kanthal V-Jet Coil, rated for 40-100W, and a 0.6ohm Kanthal V-Jet Coil, rated for 40-100W. An extra-wide 11mm resin wide bore drip tip rounds out the outstanding features of the Herakles 3 Atomizer with a copper-plated 510 connection. Utilize an atomizer made for the gods through your purchase of the Herakles 3 Atomizer. 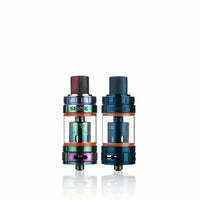 Herakles 3 Sub Ohm Tank - Sense has a rating of 4.3 stars based on 4 reviews.